At the beginning of 1943, Rommel and his Deutsche Afrika Korps began a push from Tunisia northwest to Algeria and the Mediterranean. Rommel's plan was to move through El Guettar into the Kasserine Pass, and on to Thala. Fredendall's U.S. II Corp was ill-prepared for the assault, and the DAK swiftly broke through the American lines. Many soldiers hurriedly abandoned their equipment. 400 armored and 500 "soft-skin" vehicles were disabled or captured. When the Axis forces in Tunisia surrendered on May 13, 1943, U.S. troops were reunited with scores of vehicles that had been used by the Afrika Korps, 10th Panzer, and 21st Panzer divisions. Originally assigned to the 601st Tank Destroyer Battalion. Captured by Rommel's Afrika Korps at El Guettar, Tunisia, on February 15, 1943. Assigned to the 10th Panzer Division. Recovered when the Axis forces formally surrendered in Tunisia on May 13, 1943. Gun: 75mm, 2000 fps muzzle velocity, 3" armor penetration at 1000 yards. Engine: White six-cylinder, 386 cu. in., 122 hp at 3000 rpms, 3.3 mpg. Speed: 45 mph road, 20 mph country. 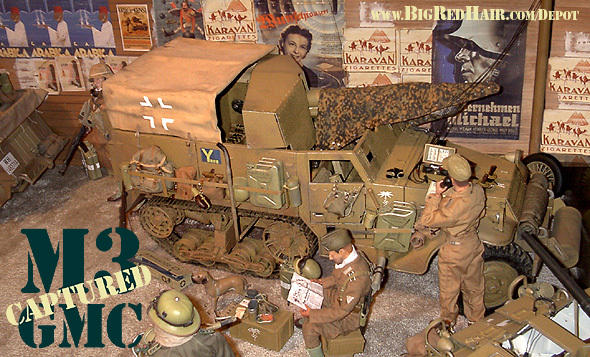 - A handmade canvas canopy fitted for the rear of the halftrack, with sewn-on straps, metal buckles, and appropriate markings. Canopy design allows the 75mm gun to pivot 90+ degrees. 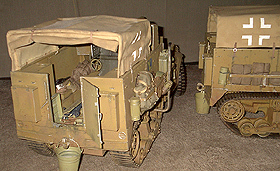 - A scratch-built cargo rack on each side of the halftrack. - A scratch-built gas can rack behind the right fender. - Gas cans for the above-mentioned cargo and can racks. - A custom "high-water" exhaust pipe on the right side. - Rack hooks for the axe and shovel. - A metal pail to hang off the back hitch. - A half-dozen assorted cloth bundles representing bedrolls, blankets, and food and clothing parcels. 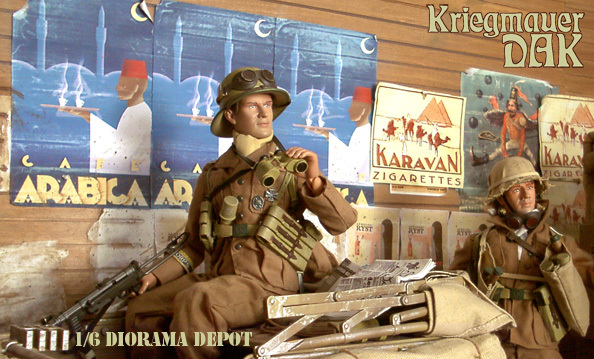 - A DOZEN items of gear, including bread bags, canteens, rifles, gas canisters, and wooden cargo crates. 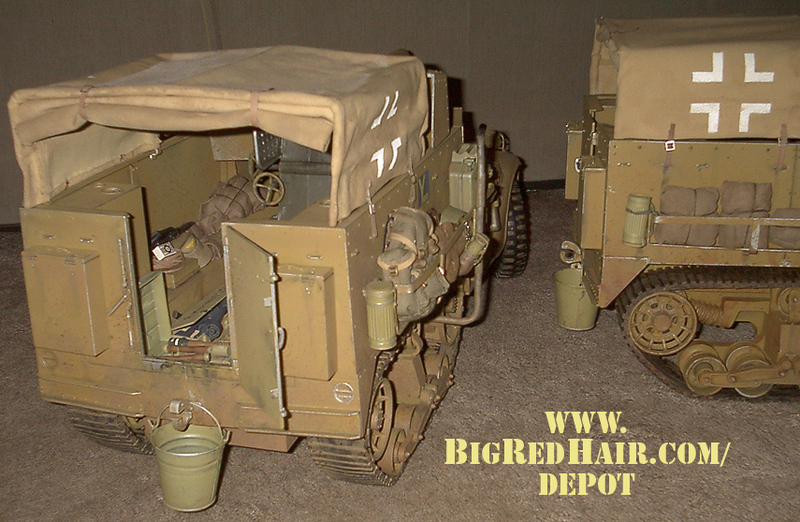 - Highly detailed weathering such as grime streaks, paint scrapes, mud splatter, rust, etc. Depot Main Page PAPERS, PLEASE!